I'm still having a hard time processing the death of David Bowie. Even if the music and the costumes and the crazy personas were not your thing, you at least have to stand back and acknowledge the scope with which this brilliantly deranged person spend forty years personifying different genres of music and changing with the medium... sometimes even acting as the catalyst for change and new subgenres. Would glam rock exist without him? Would new wave have caught on without him there? Let's just cut the thesis of this article out and paste it on my forehead: David Bowie was such a presence that the only actor who could really do him justice is David Bowie. And I would have watched the hell out of that biopic, with a 70-year-old man portraying himself at ages 20, 25, 30, etc. It is not to be. Though Hollywood might be licking their chops at the prospect of a proper Bowie film (and politely ignoring that one film buff who keeps bringing up Velvet Goldmine), I have an alternative idea. It's been done before with Bob Dylan in I'm Not There, with several skilled performers bringing different facets of the legendary musician to life. 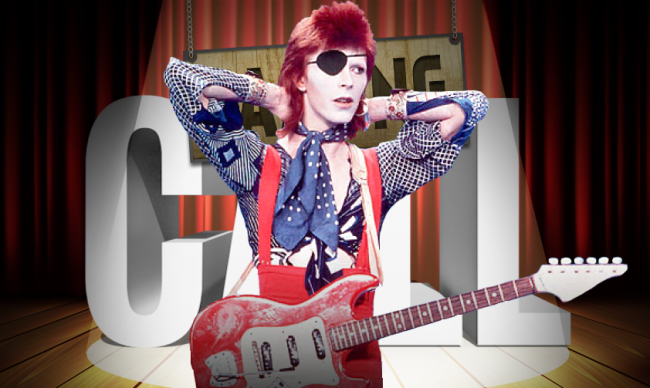 Only with Bowie, there are clear personas from his career that each actor could inhabit. But here's where I get really radical... let's not make this a movie. Let Bowie be honored theatrically, as he was so theatrical. Grab these actors and put on the greatest live performance extravaganza ever created. And film it, you know. For posterity. This seems obvious and kind of a grab at her film A Bigger Splash as well as Cate Blanchett's talked-about performance in the Dylan movie, but it would be so appropriate. During the Ziggy years, Bowie created a cult of personality around the androgynous alter ego while struggling to differentiate himself between the role and his own identity. In similar fashion, the music was a strange two-sided coin of early '70s hard rock and the more pop-inspired fare to come later in the decade. Swinton has made an entire career off of being an otherworldly, androgynous cipher. It would be amazing to watch her struggle, as Bowie, with the much more seductive and accessible identity of Ziggy. It would also make for a fantastic opening thesis on Bowie and how his shifting identity led his musical style throughout his life.